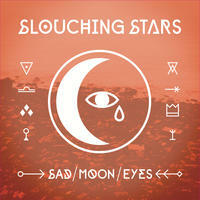 Slouching Stars : Sad Moon Eyes. Charming indie rock from the pioneers of san francisco's noise pop scene. Sad Moon Eyes is the second album by Slouching Stars, the original San Francisco treat. Their new lineup includes Tom Galbraith on drums (Men's Club, Blank Stares) and Nick Dumitriu on guitar (Turn Me On Dead Man, Local Stars) as well as lifers Rich Scramaglia and Allan Moon. Sad Moon Eyes was recorded at Nick's very own Light Rail Studios, the premier recording facility in SF. Assisting the Slouchers were Mike Drake (Oranger) and Matt Harris (Posies, Ian Moore). Sad Moon Eyes is a classic slice of San Francisco rock with a dusting of noise and two heaping cups of pop. License Charming indie rock from the pioneers of san francisco's noise pop scene by Slouching Stars for your project. Play the music of Slouching Stars in your restaurant or store.